1. Add the onion to a frying pan, add 1 tbsp olive oil and cook for 3-4 minutes until soft but not coloured. Add the garlic, chilli and spices and cook for another minute. Add the mint, chickpeas and beetroot, season and mix to combine. Remove from the heat and leave to cool slightly. 2. Blitz the mixture in a food processor until nearly smooth. Scoop into a bowl, add the breadcrumbs, walnuts, coriander and seasoning. Divide the mixture into 6 and shape into sausages, then push a skewer through. Chill for at least 1 hour or until ready to use. 3. Preheat the barbecue or grill. Oil a large piece of foil and place over the barbecue or grill rack. Brush each kofta with olive oil and cook over a medium heat, for 8-10 minutes, turning gently with a fish slice or tongs to lightly brown on all sides. Toast the pittas on the rack at the same time. 4. 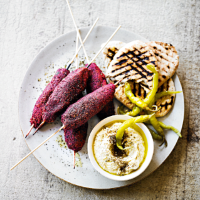 Serve the kofta with toasted pitta, houmous, raita or tzatziki, sliced tomatoes, cucumbers and hot pickled chillies, if you like. Cook’s tipReplace the breadcrumbs with ground almonds to make this recipe gluten free.